The musical Les Miserables begins and ends with the sung words “Look down!” That is, look down at the suffering, the poor, those who are told to look down, those who don’t dare lift their eyes to dream. There is a feeling of the socially-conscious Dickens’ work to Les Mis. The nemeses are introduced early: Inspector Javert (Russell Crowe) towers over Jean Valjean (Hugh Jackman) who is under his merciless, but not sadistic, command. Javert is a man of untempered justice, and has put himself under the law’s impersonal, blind eyes, as well. He believes salvation—of every kind—lies in the letter of the law. For those still not familiar with the storyline, the crux is how two different men react to similar misfortune. But they are not polar opposites: one an angel, one a demon. Valjean was shown great mercy and kindness by a bishop that was a turning point in his life. He tries to pass this on to everyone he encounters, including Javert, but Javert’s God exacts revenge and punishment. The action takes off immediately. There’s no dilly-dallying. A colorful, rich, but uncomplicated network of characters enter the story very naturally, and we get to know them very quickly and very intimately—probably because we see the most fateful events of their lives which they then proceed to sing about, revealing their inner discourse to us, something that is usually restricted in the medium of (purist) film. The film is filled with very realistic situations we have all experienced: being forced to compromise, dire financial straits, tough decisions, unrequited love, separated lovers, begging mercy, showing mercy, paying dues, taking up a cause, etc. There’s kind of “something for everyone,” big chunks of life—without being overstuffed. Les Mis is more than “set against a backdrop.” The backdrop—that of an uprising in France in 1815–is an integral part of each character’s story, even though some situations/circumstances, such as poverty, are universal and repeat themselves in every time and place. The film ends by returning to the scene of the uprising and the people (“the miserable ones”) singing a song of hope for the future. 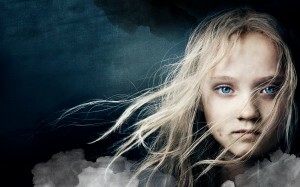 The question seems to be: Who are you in Les Mis? Previous ArticleHuman Rights or Human Wrongs? That’s a good question, sister … who are you in the film? It’s been a long time since I read the novel … but after seeing the opera again, it struck me that Javert was a Calvinist with his unforgiving God … Is there any hint of that in the novel?